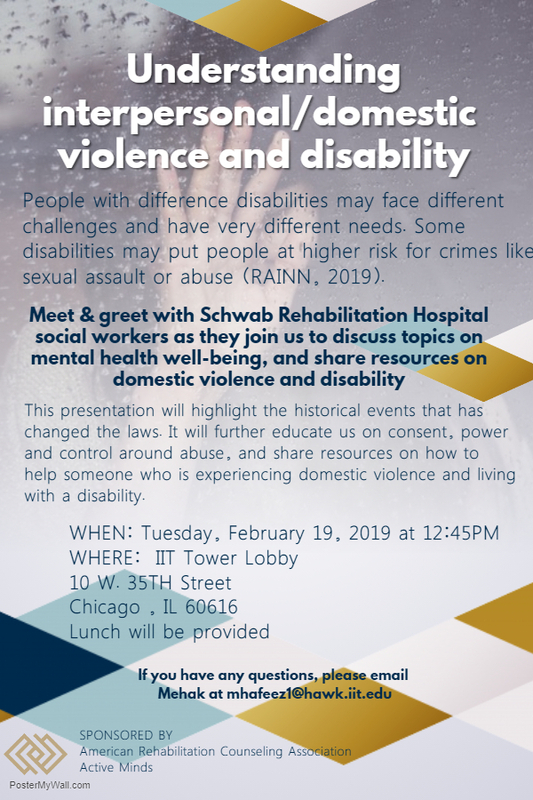 Join the American Rehabilitation Counseling Association and Active Minds chapters at Illinois Tech in welcoming professional staff from Sinai Hospital-Schwab Rehabilitation Hospital to discuss their work and educate participants on interpersonal and domestic violence among people with disabilities. They will also share community resources, and internship and employment opportunities. Stefany Campos is a licensed social worker with more than five years of experience as a domestic violence counselor at Schwab Rehabilitation Hospital. Campos is a graduate of the University of Chicago’s School of Social Service Administration, where she earned her M.A. Her expertise is working with trauma survivors who have disabilities. Campos is bicultural, bilingual, (English/Spanish) and trauma-informed. Christine Hart is a graduate of Loyola University Chicago’s School of Continuing & Professional Studies, where she earned a B.A. in management as well as a Certificate in Paralegal Studies. Hart has since worked periodically as a contract paralegal in civil litigation in Chicago’s Loop on various cases. She also works as a freelance writer for Audacity Magazine, an online magazine that focuses on the lifestyle of the disability community, advocacy, and disability awareness. Hart also runs and operates an online blog, where she discusses life as a woman with a disability. She started a bracelet gifting project for mom’s with children with special needs. She is in the process of joining Rush University’s Parents Advisory Board and is currently working toward being a motivational speaker. For questions or feedback, please email Mehak at mhafeez1@hawk.iit.edu.